For nearly forty years we have been one of the UKs most innovative independent off-licences. We strive to give the best possible quality and service by offering a unique selection of carefully chosen products along with a no-quibble guarantee on everything we sell. This includes a great choice from small independent companies and some of the leading brands. We particularly focus on working with suppliers who have the ability and determination to deliver the right quality at the right price. All these can be discovered in a modern air conditioned shop with a huge range of chillers so you can enjoy your purchases as soon as you arrive home. In addition to the convenience of a modern off-licence we stock everything you need to brew your own beer or wine at home and when you want to put your feet up, choose from our rental library of around a thousand of the latest DVDs. The place to go before the weekend! 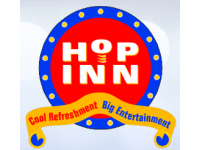 The Hop Inn has a good selection of drinks and snacks to get you prepared for the weekend. There is also an area to purchase home brew supplies and kegs. At the back there is a selection of DVDs and a very small collection of Blu-Ray disks. The only reason I haven't given them a 5 start on food is that they don't sell things like pork pies and sausage rolls. I would like them to expand their selection of Blu-Ray disks as I have a Blu-Ray player and would like to be able to rent disks for it.